Argentium wire is used for the wire work design and the hand formed earwire, with an accent of dark navy, fine gauge, artistic wire. Handmade lampwork glass beads dangle below, in shades of amber, forest green and dark navy blue. 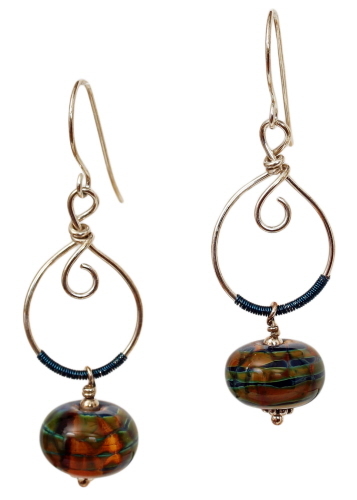 Earrings measure 2⅜ inches from top of earwire to bottom of dangle and weigh 0.2 oz each.